One of the delights of Spring sunshine is the opportunity for taking tea in the garden on the patio. 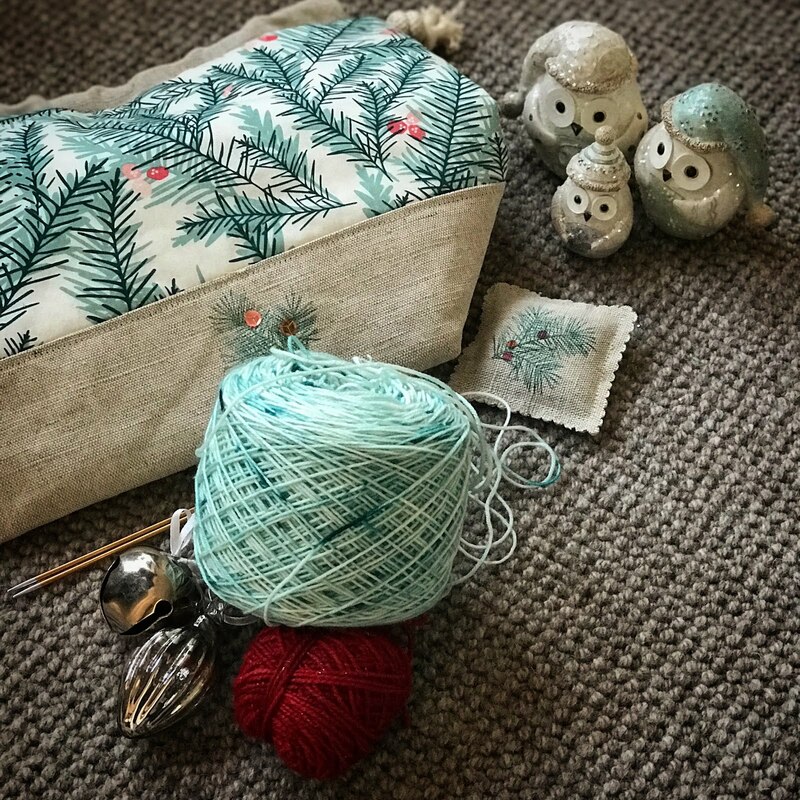 Armed with some sewing and a good book or magazine nothing could be more relaxing and calming. I am enjoying reading a, new to me, journal called Elementum which Rob Cohen describes on the cover as "as much a doorway as a publication". 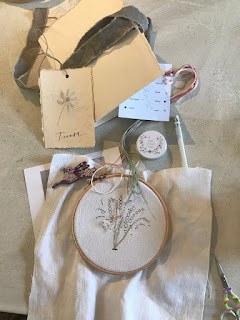 It is a collection of writings on nature, landscape and people but more than that it has beautiful photographs, paintings and crafts too. 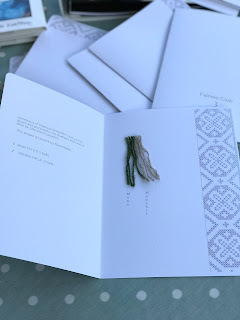 I am embroidering "Chatelaine" by Inspirations which is another beautifully produced magazine that I adore reading. 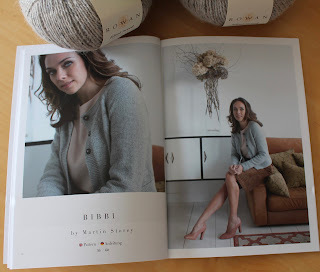 There are so many stunning projects in the magazine many of which I have thoroughly enjoyed sewing. 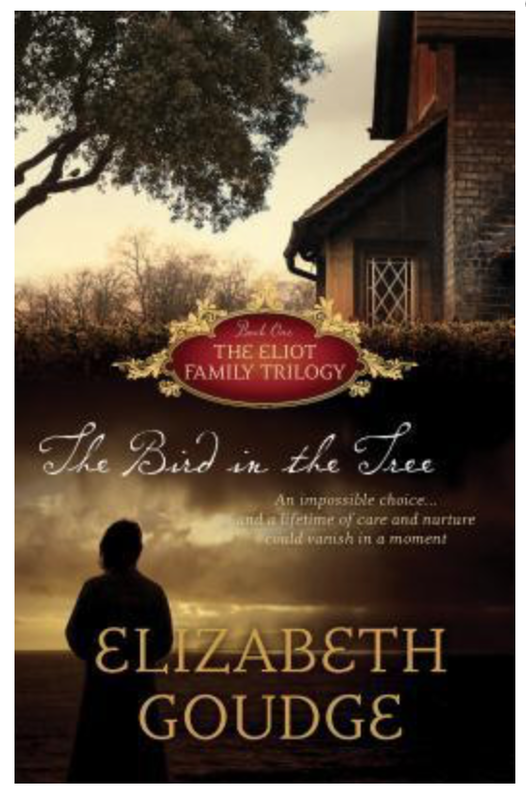 These are the editions published by Hendrickson and I love them for the quality of production and the beautiful cover photography. They are printed in America. 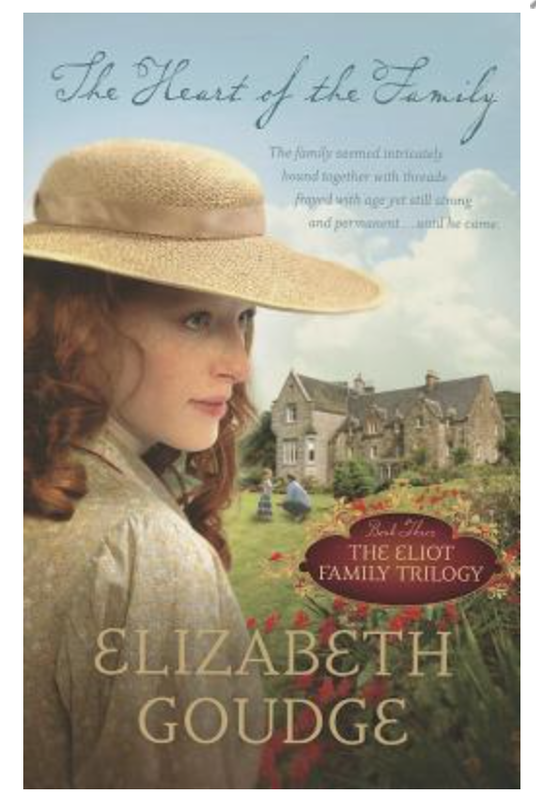 The last one was written over a decade after the first and it will be interesting to see if there is any change in her writing by then. 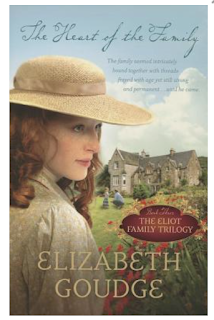 We follow the family life of the Eliot's after the World Wars as they "struggle to make sense of life in the peaceful and spiritually-renewing surroundings of Damerosehay" the house at the centre of the stories. 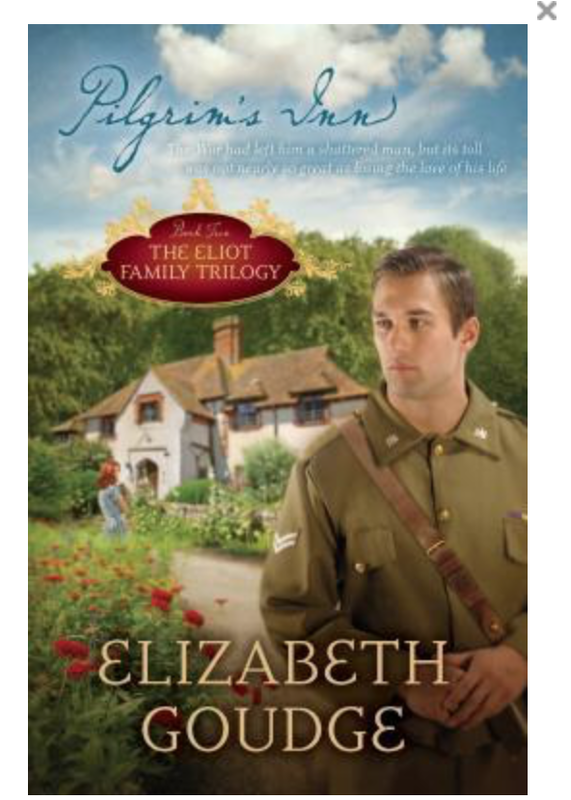 Elizabeth Goudge's writing has a great sense of personal sacrifice for the greater good of family and very much reflects her own life. She writes beautifully about landscape, inner thoughts and wisdom. I am looking forward to this last book in the trilogy and to lovely afternoons in the garden sewing and reading. What a Winter it has been. 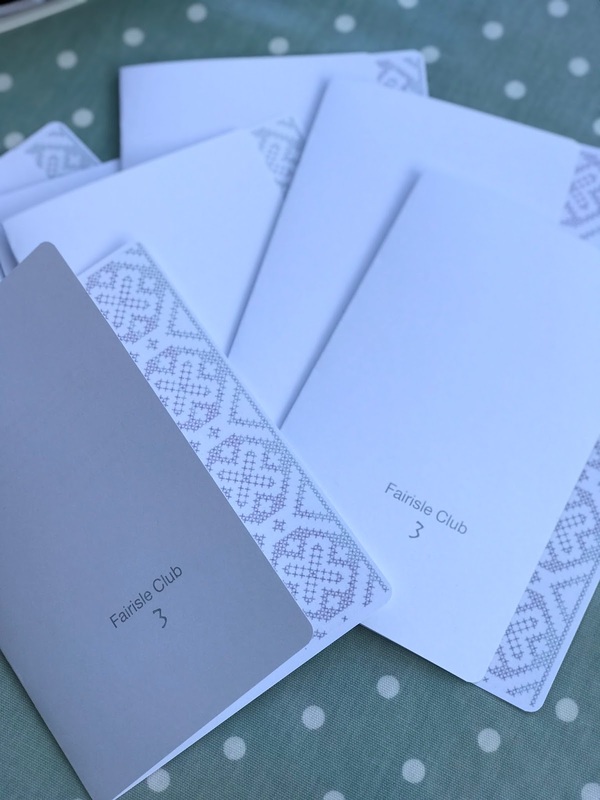 We have had temperatures in February reaching 18 degrees Celsius and now in April we have snow showers and sharp frosts here in some parts of the UK. 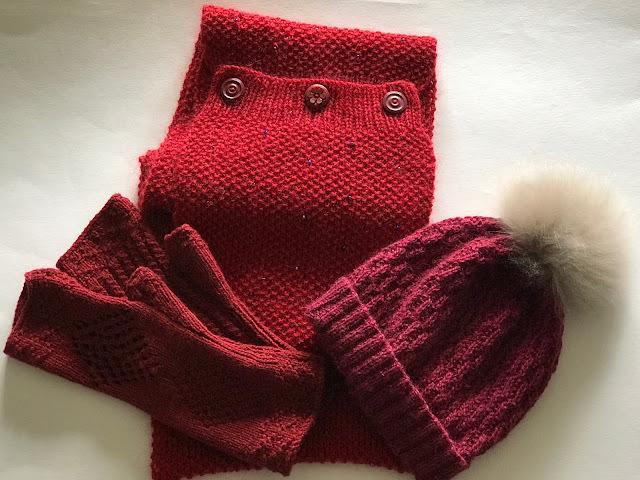 One thing that will always come in useful during the cold spells in the winter months are some bright, warm accessories and I have been experimenting with yarns and reds. 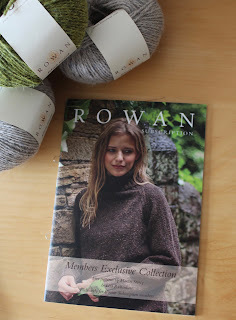 I had already started, and wanted to finish, Veiled which is by Martin Storey and was in Rowan Magazine 62. It is a scarf in moss stitch which buttons up to create a continuous loop. 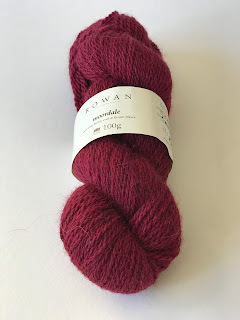 It uses Rowan Kid Classic in 847 Cherry Red. The Kid Classic is made up of loosely woven strands which can split easily when knitting. 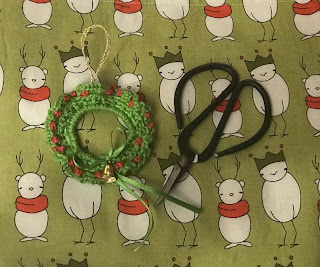 I found the recommended beads fit very snuggly when strung on the yarn and was causing damage to the wool so I opted for applying them with a thin crochet hook as I went along instead. 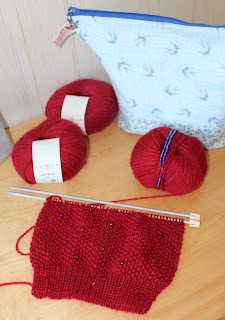 The wool does give a good stitch definition and the scarf is very warm and pretty to wear. 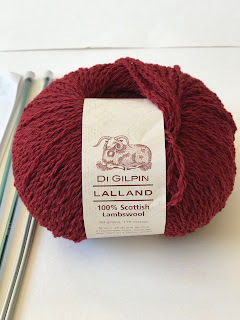 Next I decided to try some Di Gilpin wool and she had a pattern for Seol Gansey Mittens which used one ball of the Lalland 100% Scottish wool in 50gram balls. 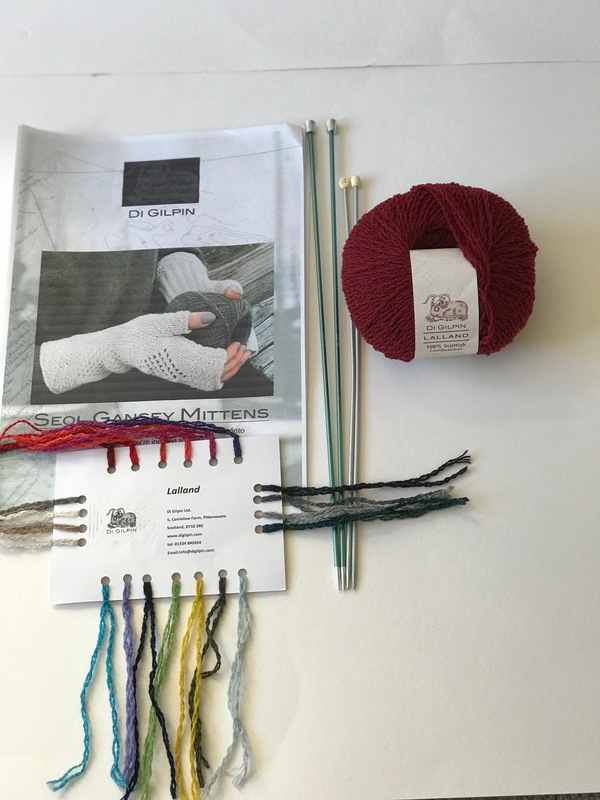 The pattern was easy to follow (except for the times I kept going wrong because I have terrible powers of concentration) and the finished mittens were absolutely beautiful. I loved using the wool although I know lots of people found it very splitty (much like the Rowan) as it is made up of loosely woven threads but blunt ended knitting needles will help with that problem. 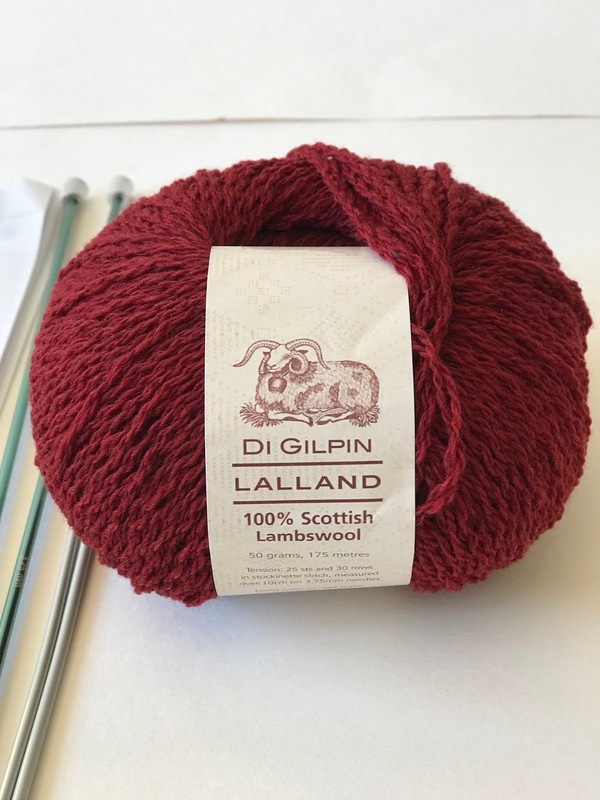 The pattern definition this wool gives is superb. My final foray into red yarn was also to try a new, to me, wool which was Rowan Moordale and I made The Buckler Hat also by Martin Storey. This was a beautiful traditional wool with an added softness achieved by blending it with very soft alpaca. 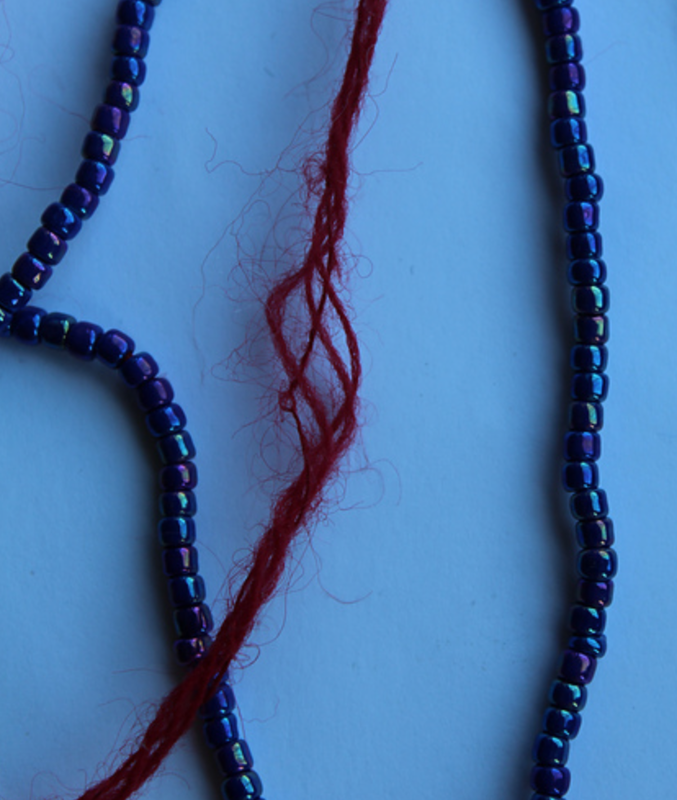 Technically then it would be described as a skein yarn rather than a skein of wool. 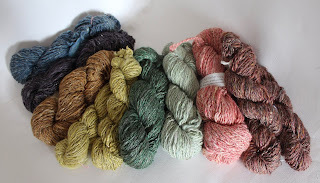 70% wool and 30% alpaca in 100g skeins. 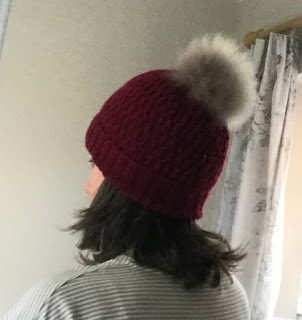 The hat took one skein of yarn and I used smaller than recommended needles to achieve a tighter gauge and I also knitted a deeper ribbed section which I folded back on itself to make a less slouchy bobble hat. 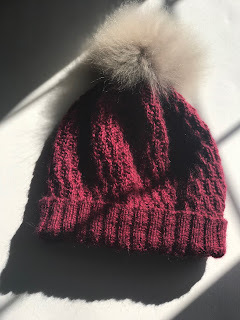 I used a Toft Alpaca pom pom which I bought at the Knitting & Stitching Show at Olympia. I loved knitting this hat and am so pleased with the finish. 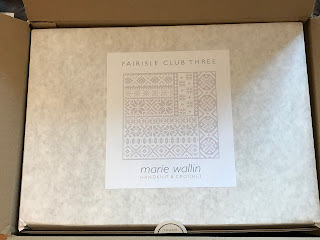 You have to pay attention to the stitch Martin uses which is similar to brioche where you knit one below because unravelling will be very difficult if you go wrong. I thoroughly enjoyed exploring some British yarns and wools and the lovely cheerful reds have resulted in some gorgeous Winter accessories. 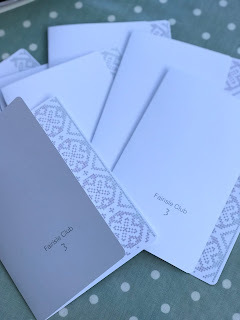 It is good to finally get back to blogging as Instagram seems to have overtaken how I have been sharing my crafting life but there is no time for more detail there so I have enjoyed sharing in a little more depth with you some of my finishes so far in 2019. 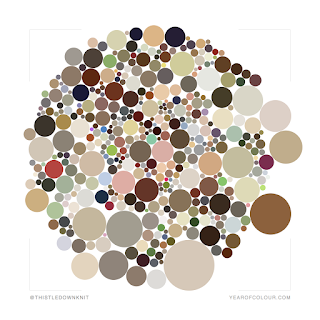 How lovely it was to welcome in a New Year and feel there are just so many possibilities to be explored and enjoyed. 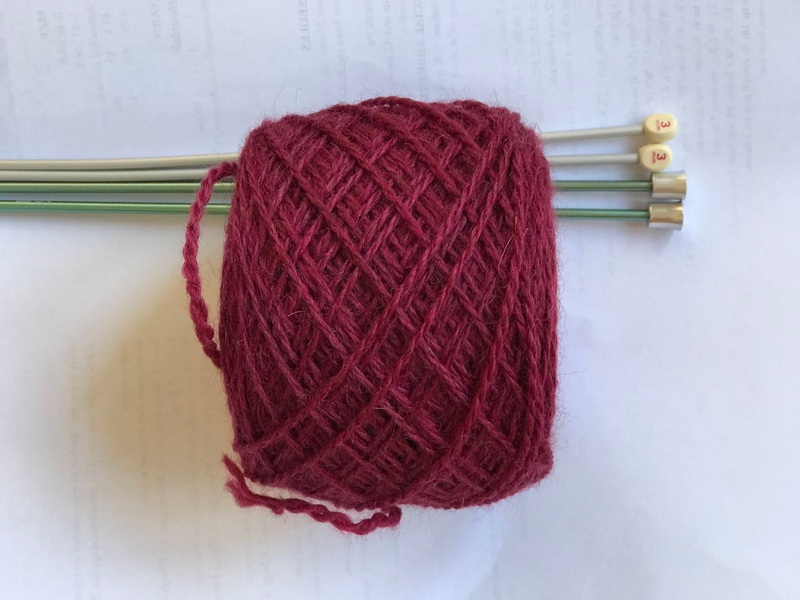 The Knit along with Marie Wallin for the edge to edge colour work cardigan Lerwick is going very well and I am enjoying knitting on this project. I am very pleased with all I have learnt along the way which I can see is making an improvement in the technique and the resultant patterning and tension in the fabric is much better. 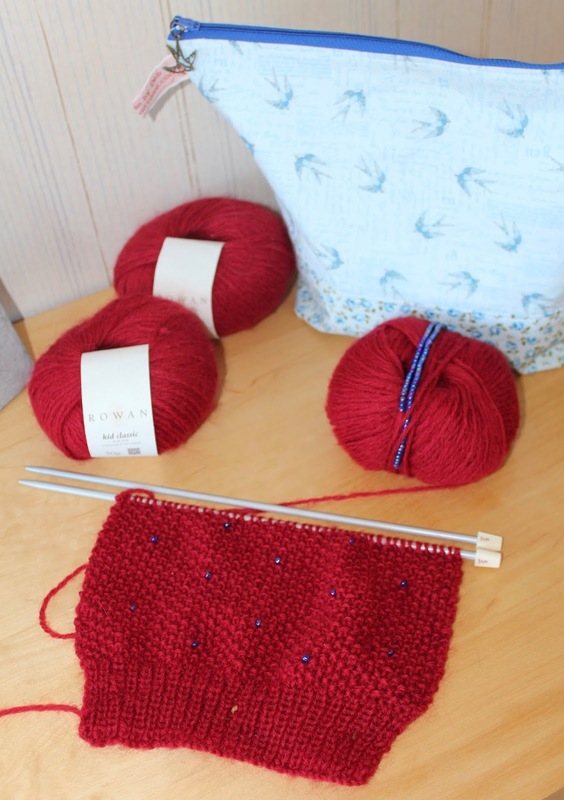 We have begun the section with the steeks for the sleeves and are awaiting our next video. 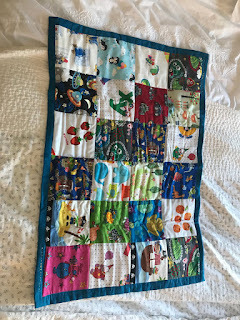 I would like to make a goal of finishing all other colour work projects that I have waiting or already started. 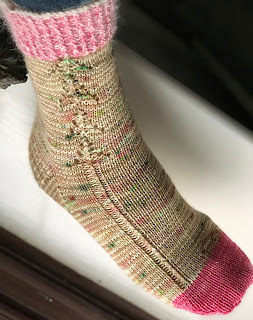 I knitted or cast on socks for every month of the year in 2017 in an attempt to get through all the sock yarn I have and although I am not going to attempt that again I wanted to aim at using stash rather than buy new yarn for sock projects but along came the Flower Power Fund which is raising funds for Marie Curie Nurses. 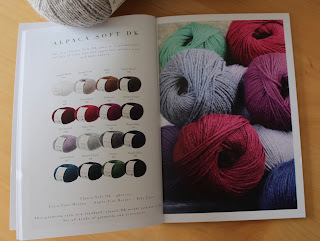 There will be twelve yarn collaborations throughout the year and I just had to support that. 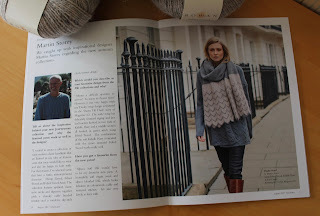 Norah George Yarns brought out a Snowdrop yarn and pattern for it in January. 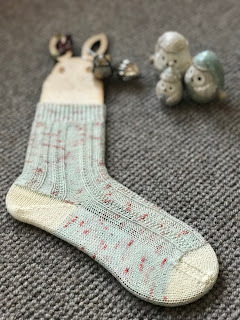 Then Helen of Handmade Curious started a sock club releasing a pattern every month that just seemed perfect for this. Just after that Danni of Little Bobbins Podcast released her new trilogy of sock patterns based on a romantic notion of the two names inscribed in her antique engagement ring. My goal will be to complete the sock society patterns. 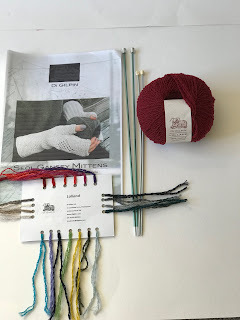 I have yarn now for three cardigans or jumpers and would like to finish them this year and also to complete already started projects such as the Betty Mouet jumper and a slipover which has been on the needles far too long. 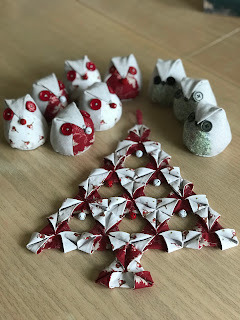 My goal will be to finish three garments this year. 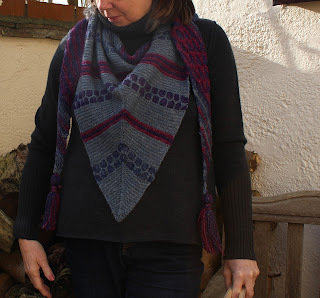 I completed Carol Feller's of Stolen Stitches Bubble Wrap shawl knit along which was great fun and the yarn was fabulous to use. 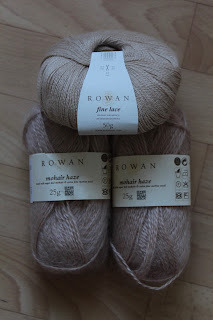 My goal is to take part in Ravellenics, Tour de Fleece and sock knitalongs. Rowan Autumn/Winter 2017 season is here! So I thought I'd take a little tour through my new acquisitions with a quick catch up on my Rowan projects too. I have a subscription to Rowan Magazine and I particularly enjoy the Autumn/Winter editions. There is a free gift with the subscription and I chose the "mohair haze" and four 25g balls arrived with two patterns by Martin Storey for a hat and wristlets. 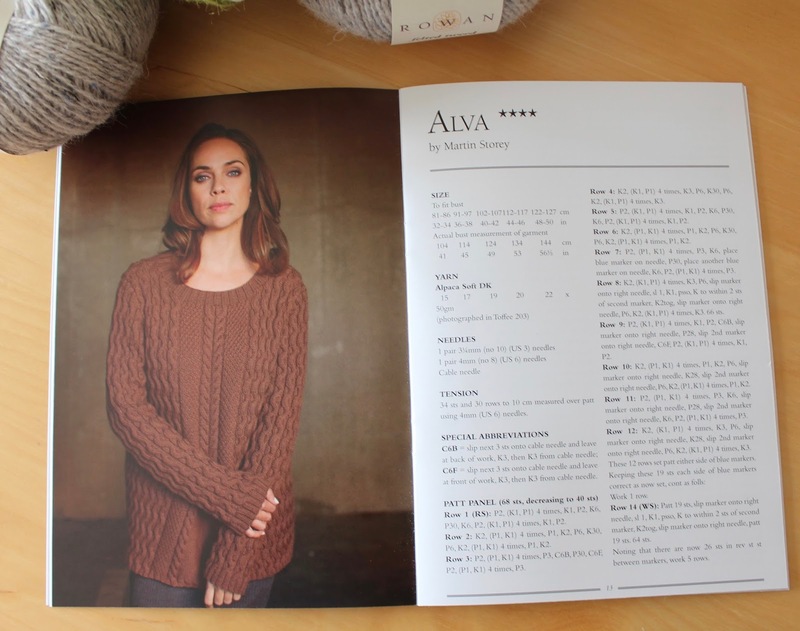 The magazine also came with a newsletter and a Members' Exclusive Collection of patterns. Having seen the beautiful gift yarn I recalled a pattern by Kim Hargreaves called Mist which is a lovely slouchy ribbed hat in her book "Still" and decided that I would use two of the balls combined with fine lace to knit that instead of the Martin Storey pattens although I might be able to make the wristlets from his pattern with the other two balls of yarn. 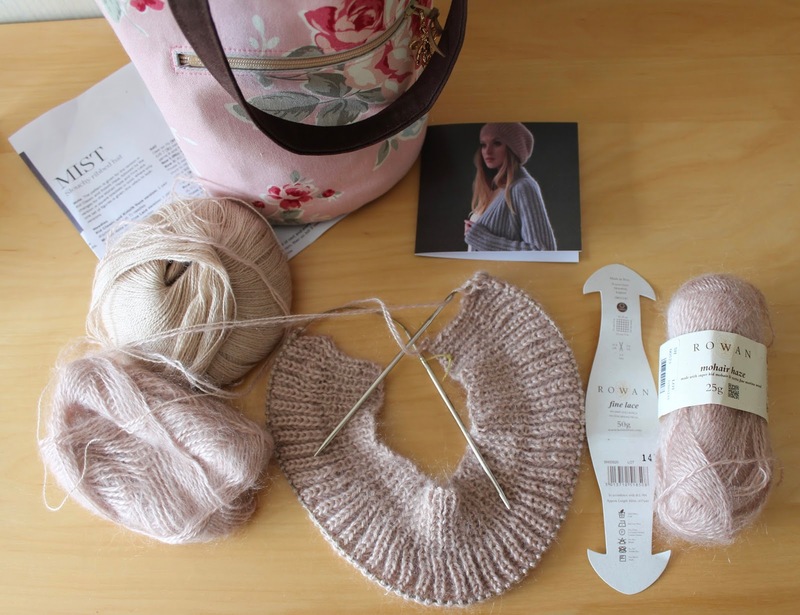 I'm making some progress and am intrigued to find myself knitting a new stitch to me which is creating the interesting rib in this hat pattern. The hat is knit in the flat and seamed. 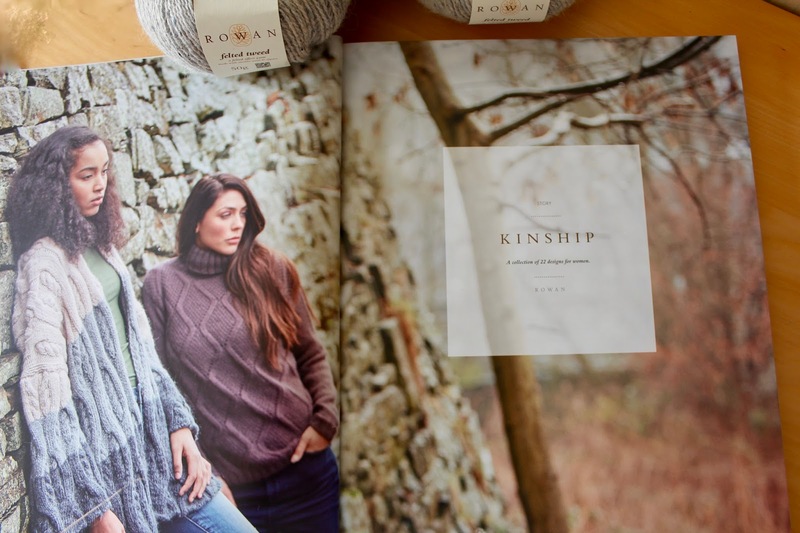 Rowan Magazine is usually divided into stories and this edition has two: Kinship - which is a story inspired by Rowan's original roots, housed in a beautiful old woollen mill and the surrounding landscape of the stunning Yorkshire Dales. And Dawn til Dusk - which was inspired by knitwear that can take you from the office to evening drinks or slouchy layer pieces that can be worn for an afternoon stroll or as a cover-up over evening wear. I have already fallen for a cheery scarf design by Martin Storey called Veiled which will look great with my winter coat. The other designers featuring in this edition are: Lisa Richardson, Sarah Hatton, Marie Wallin, Jennie Atkinson, Galina Carroll, Emma Wright and Georgia Farrell. 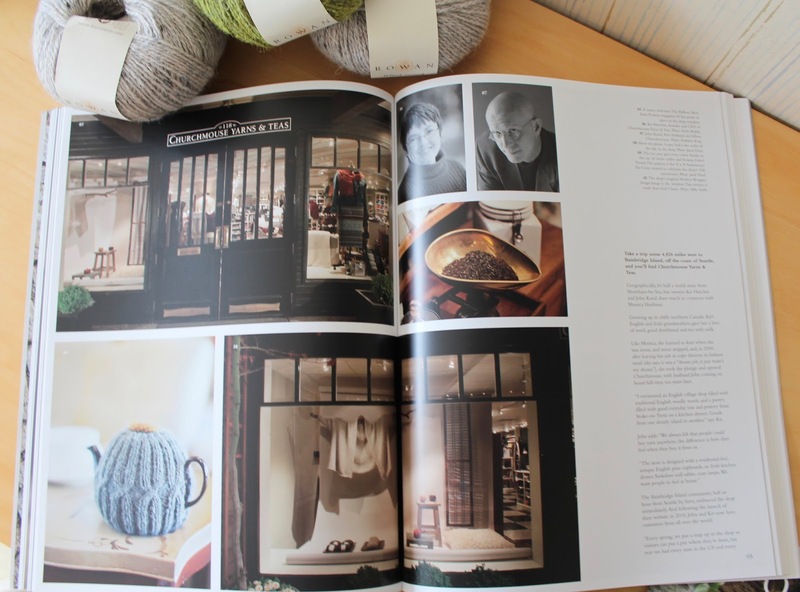 As well as the patterns there are articles and I very much enjoyed the one about Churchmouse Yarns where they sell tea as well as wool! That's a perfect combination in my view. 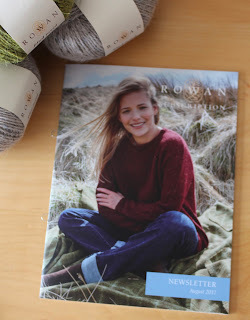 The newsletter comes out twice a year and usually has a free pattern and a couple of essays or interviews as well as details of new yarns and books. It takes a look at the new Autumn/Winter 2017 season, talks about catwalk trends, looks back at previous editions, compares heritage Rowan with the Rowan of today, gives a list of Rowan magazines and brochures and lists workshops at John Lewis. It packed with articles and also runs a fun competition with a signed copy of Lisa Richardson's booklet Timeless Cocoon as the prize. 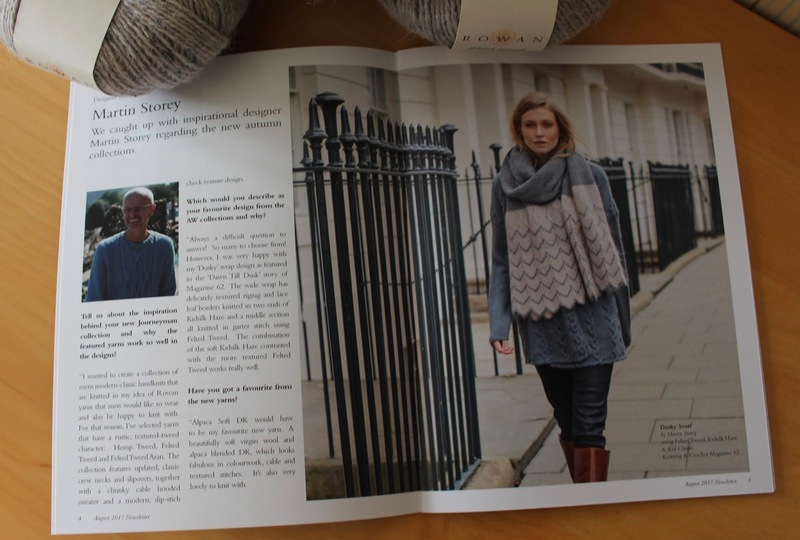 The interview with Martin Storey was very interesting and I do think the beautiful oversized scarf in the feature will be very popular. 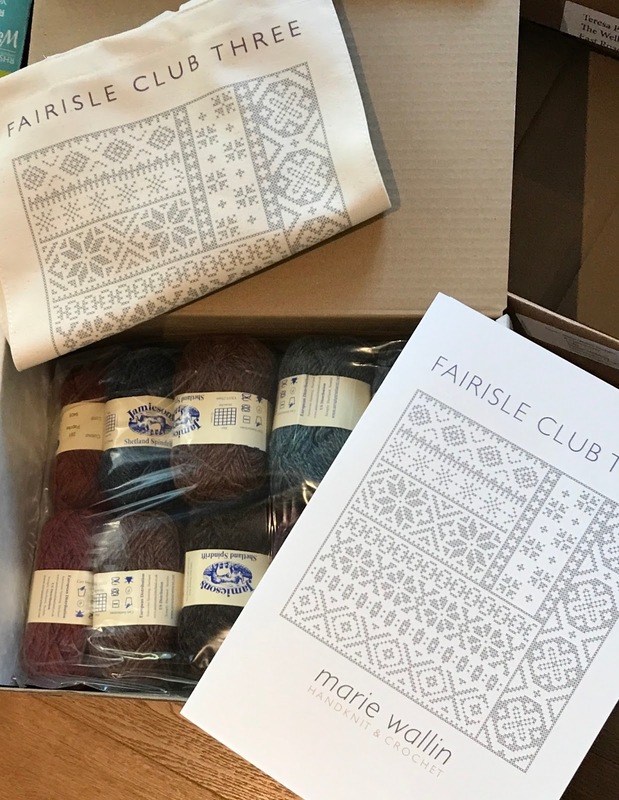 As well as the newsletter there is the Members Exclusive Collection which contains five patterns by Martin Storey and Lisa Richardson. The Timeless DK booklet is a collection of six designs by Martin Storey and has some very pretty everyday cardigans which I think will look stunning in the new alpaca soft dk which Martin says is his favourite of the new yarns as it looks fabulous in colour work, cable and textured stitches and is lovely to knit with. 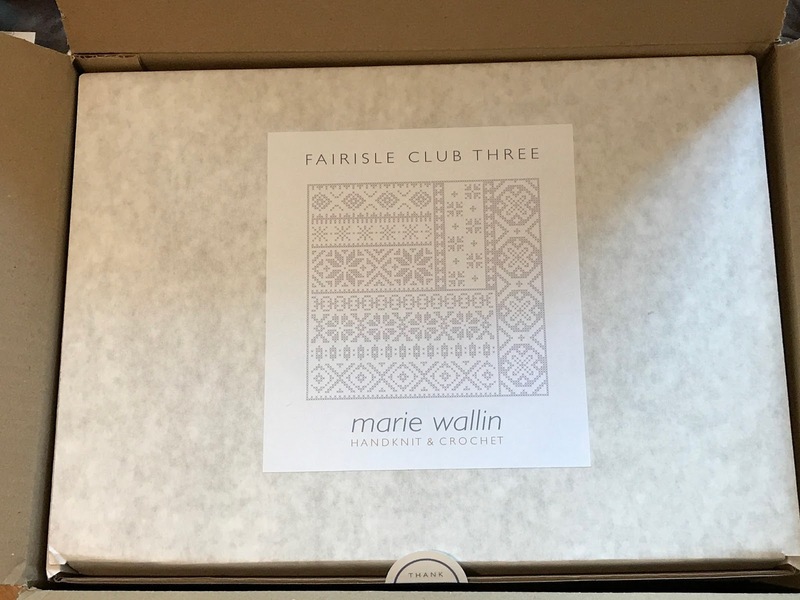 I can't wait to try it. I think the colour palette is so pretty. It is a soft mix of extra fine and super fine merino wool and baby alpaca. 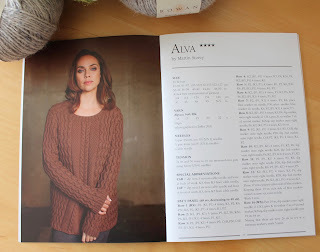 Bibi, the pattern below is my favourite and the model, Lara looks gorgeous in it. 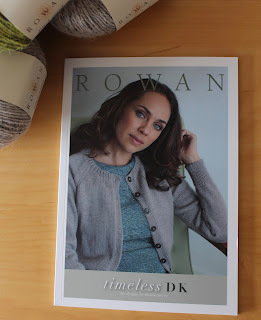 It has two dots which Rowan suggests has simple techniques with straight forward knitting and introduces various shaping techniques and is for the knitter with a little experience. 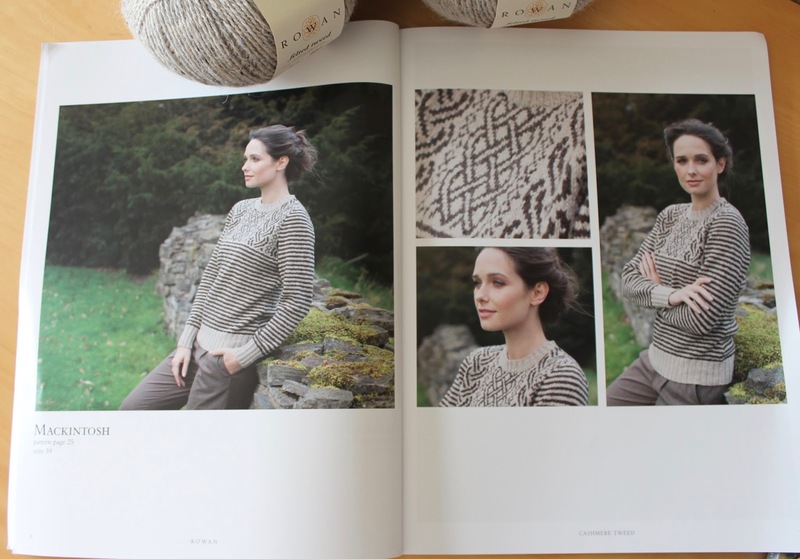 Then there is another new yarn called Cashmere Tweed and the booklet that accompanies that yarn has seven modern Scandinavian and Icelandic inspired patterns. 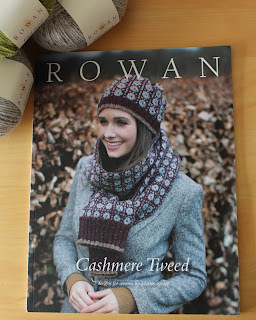 I love the hat and scarf on the cover. Cashmere tweed is a premium yarn made with virgin wool and cashmere. 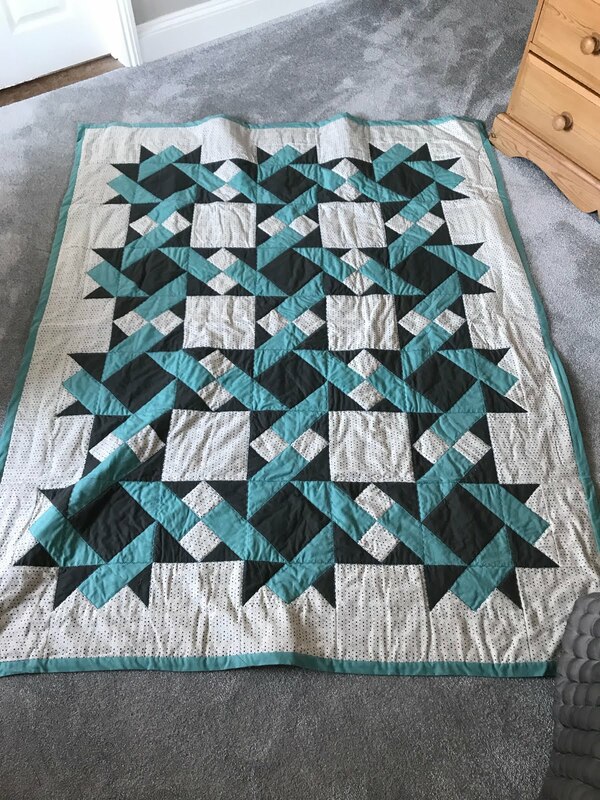 Here is another beautiful pattern with a lovely celtic colour work pattern designed with a very contemporary feel. 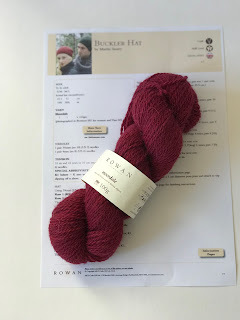 So now for a little Rowan works-in-progress update. 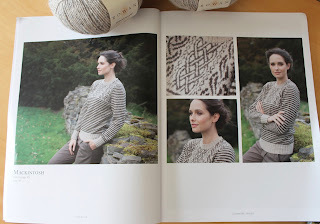 I am working on Amaryllis from Marie Wallin's book Springtime which uses both fairisle and intarsia techniques and which I am hoping to have completed before starting Marie's new Fairisle Club 3 in November when we will be knitting the cardigan called Lerwick. 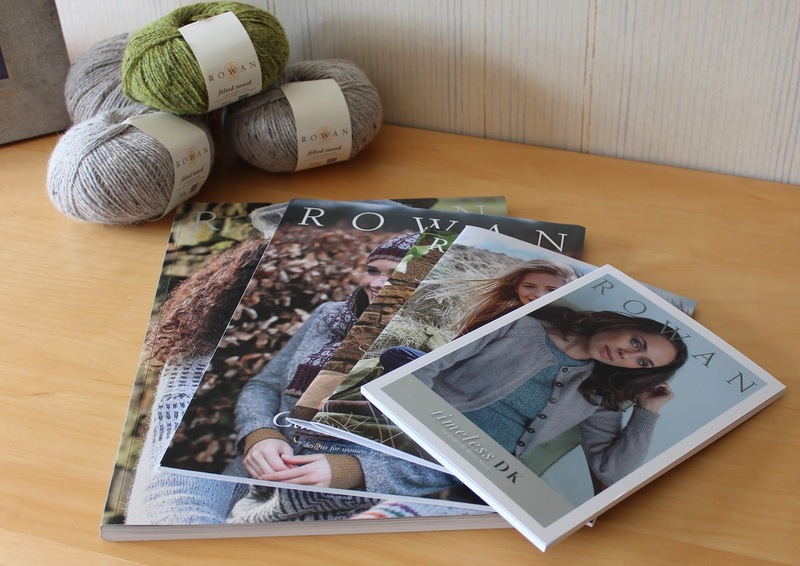 So a busy knitting time ahead but first I must go on an enforced knitting break as I have developed some problems with my left thumb joint (I am a right handed knitter) and I am so glad there are such a lot of new Rowan publications to keep me occupied while I heal!